Laura Dunlop QC has received the award of Doctor of the University. More than 650 graduates celebrated with honorary graduates Alexander McCall Smith and Laura Dunlop QC at the University of Stirling’s Winter Graduation. The degrees were conferred by University Chancellor and BBC broadcaster James Naughtie at two ceremonies held in the Gannochy National Tennis Centre. 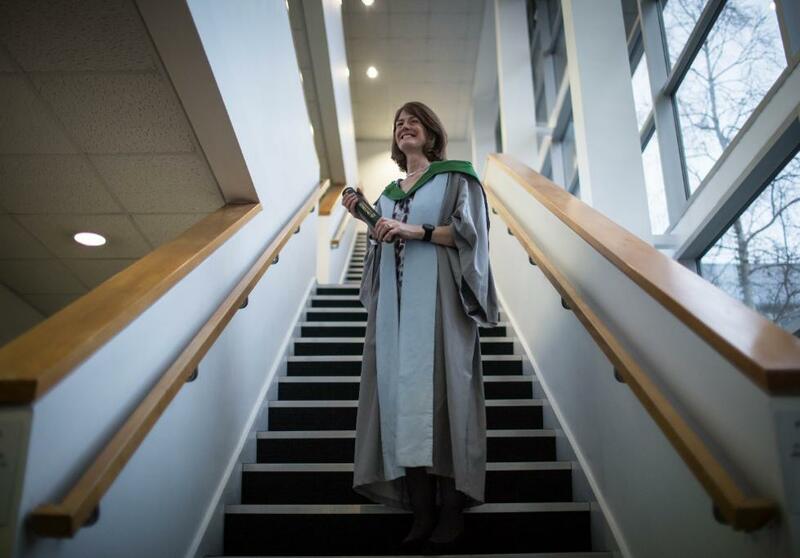 Leading lawyer Laura Dunlop QC received the award of Doctor of the University in recognition of her outstanding contribution to the support of vulnerable people in Scotland through the practice of law, and as an outstanding role model for Stirling’s female students. Congratulating graduates from the Schools of Applied Social Science; Education; Health Sciences; Natural Sciences and Sport at the morning ceremony Dr Dunlop said: "It means so much to me to receive this honorary degree from a University that I visited as a child when it was just newly opened." Since 2005, Dr Dunlop has held office as Procurator to the General Assembly of the Church of Scotland – the first female to hold this appointment. She was also the first female law Commissioner in Scotland and was responsible for addressing protection of the right to liberty of adults with incapacity. After thanking the University on behalf of the graduates, Dr Dunlop spoke on the opportunities she had been given and her observations of a trip to Africa commenting that the single biggest change that would make a difference to those living there was to have a supply of clean water. Concluding her speech she encouraged graduates to think of the difference they could make to others as they moved on to the next chapter of their life by saying: "Whether in your work, charitable donations, campaigns or powerful positions you may reach remember, everyone needs a supply of clean water." Award-winning author Alexander McCall Smith CBE received the award of Doctor of the University in recognition of his outstanding contribution to literature. Addressing graduates from the School of Arts and Humanities and the Stirling Management School at the afternoon ceremony McCall Smith said: "This has been a momentous day for you all and I’m honoured to have been part of it and recognised by the University for my work." The award winning author and Professor of Medical Law - with many academic publications to his name - has penned several children’s books as well as his international best-selling series The No.1 Ladies’ Detective Agency, which has been translated in 45 languages and sold more than 20 million copies worldwide. Finishing his speech McCall Smith shared advice to the new graduates by saying: "As a storyteller the best guidance I can offer is treat your life as a story, have a plot A, a plot B and as I do in my stories, always aim for a happy ending." Stirling’s Winter Graduation follows recent international ceremonies in Singapore, Oman and Vietnam and the University’s Highlands and Western Isles Graduation in Inverness. The University is ranked second in Scotland and seventh in the UK for employability, with 96% of graduates in employment or further study within six months.